There are several slang terms that represent money and/or a person who's making it. Many of them use food references, like: eatin', caked up, dough, cheese/cheddar, bread, and chips. Well, there aren't too many people out here today making chips like Dale Earnhardt Jr. Last month, Forbes ranked him as the highest-paid NASCAR driver for the fifth-consecutive year. And you don't even have to know much about NASCAR to know that Dale Jr. makes a lot of money away from the racetrack. You likely see the Mooresville resident frequently starring in national TV commercials endorsing products and companies, or you see products bearing his name in stores. The latter is what happened to me tonight. I made a trip to Bi-Lo tonight and stumbled upon a display case of "Dale Jr Foods" potato chips. I had no idea Dale Jr. had gotten into the snack game. Once I got home and did a little Googling, I learned that this food venture with KLN Family Brands, a Minnesota-based company, was announced in January. 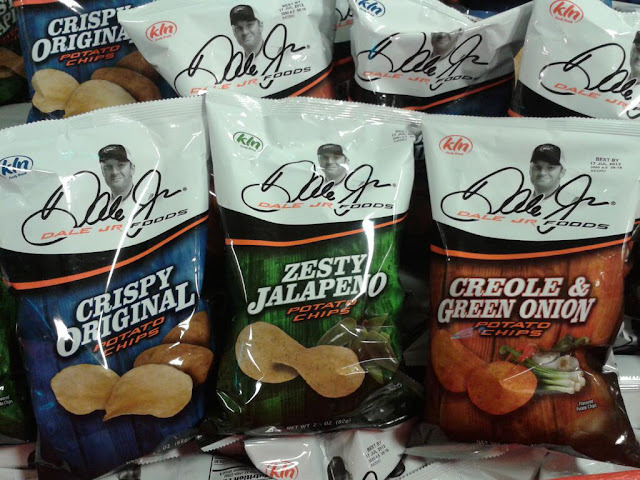 And that the first products, to have begun hitting stores in February or March, would be four flavors of potato chips: Crispy Original, Carolina Barbecue, Creole & Green Onion, and Zesty Jalapeno. Interestingly enough, tonight I saw three of those four in the store, but the Carolina Barbecue was missing. My assumption is that's the flavor Charlotteans have been snatching up first, out of curiosity if nothing else. Curiosity is what led me to buy two bags--one each of the original and jalapeno. I haven't tasted them yet, though. NASCAR drivers' names and faces on products is common. Heck, their race cars and driving suits are the opposite with brand logos all over them, so sponsorships and endorsements literally fund the sport. But Dale Jr. appears to be taking it a step further because "Dale Jr Foods" sounds like an entire division of a company in which we will eventually see other food products. But hey, if his Hendrick Motorsports teammate Jeff Gordon can successfully sell wine, then why not? UPDATE 4/18/13: I tried Dale Jr.'s potato chips today, both the Crispy Original and Zesty Jalapeno flavors. They kind of remind me of Wise brand potato chips, but Dale Jr.'s are crispier/crunchier, which is very important to me in a chip. I was particularly impressed with the jalapeno flavor. I'm interested in tasting the Carolina Barbecue now. The Dale Jr. name is what will lead people to giving the chips a shot, but I can't say that I plan on breaking away from my regimen of Lay's, Utz, and Cape Cod.